Has anyone heard of an Alenax bike? Instead of pedaling a circular motion, the pedals pump up and down vertically. Strangest riding bike I've tried. A friend bought one at a garage sale. The Alenax is a great example of an outsider inventing a solution to a perceived problem, creating something that is useless for the intended user. Much money was thrown into the design and manufacture of the Alenax, and several years of bicycle-show attendance with many models. As soon as you ride it, you'll realize why it doesn't work, even though it has a continuously variable gear ratio. It isn't a CVT (continuously variable transmission) because it relies on reciprocating levers to pull the chains, essentially a rowing machine on which the "oarlock" (fulcrum) is movable. The main problem is that the invention is based on constant-velocity lever pedals, instead of circular cranks on which the rotating foot presents no inertial problems and on which the leg moves in sinusoidal motion. The Alenax requires the foot to reach full speed from a stop before it catches up to the load it is trying to propel, after which it must stop suddenly from full speed at the bottom of the stroke. 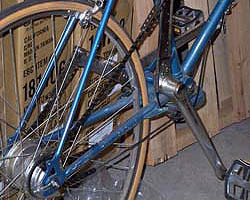 The action can be simulated by propelling a conventional bicycle with one foot locked into a pedal, rocking the pedal up and down through a small arc about the forward position. The early models had fully independent pedal levers that could be pedaled singly or in parallel or only one if you wanted. This made the return stroke difficult because the leg and crank had to be pulled back to the top. What was worse is that in the event of a bump in the road, the rider could not stand up, because both pedals would go to the very bottom, fully extending the legs, preventing rising from the saddle. 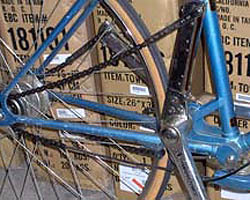 A later version employed a straddle cable over a pulley through which one pedal raised the other, also enabling one to stand on both pedals at half height as on a conventional bicycle. 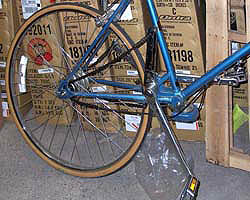 Wheel changes were complicated by two chains, one on each side of the rear wheel, each tensioned by a haulback spring. Each freewheel had one sprocket but I can imagine a large and small one to give more range with a smaller lever extension. The left side required a left-handed freewheel. Summing it up, I think the inventor (and investors) did not realize that converting reciprocating motion into circular motion is best done by a rotary crank rather than a reciprocating lever, and above all, they weren't bicyclists.